John David Miley, subject of earlier posts ( see The Marriage of John David Miley and Lessie Lee Guthrie ), married Lessie Guthrie of Ray City, GA. The Guthries were early pioneer families of Berrien County, and many of the family connection still reside in Ray City. John David Miley was a son of Narcissus Rouse and Bryant Miley. 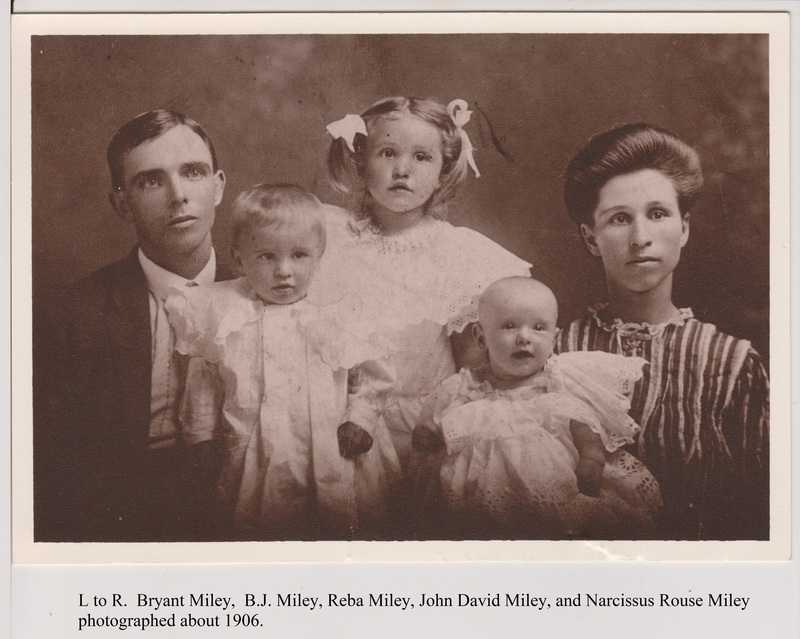 The Mileys were a prominent family in the local history of Hahira, Lowndes County, GA. Hahira is located about twelve miles west of Ray City. Family of John David Miley, Hahira, GA. Circa 1906. Left to Right: Bryant Luther Miley, Berry James “B.J.” Miley, Reba Miley, John David Miley, Narcissus Rouse Miley. Bryant Miley operated a grocery & butcher shop in Hahira. Later, after Bryant’s death in 1940, Narcissus had her own little grocery in town. B.J. Miley became a big tobacco trader, and a Hahira street one block south of Main bears his name. Grave marker of Bryant and Narcissus Miley, Shiloh Methodist Church cemetery, Lowndes County, GA.